Sadhguru looks at the many nuances of succession planning, and what it takes to implement this successfully, both for those handing things over and those receiving it. Sadhguru: See, you’re talking about businesses. Businesses usually, or initially when they start, it’s a question of personal success because of a certain volume, then it becomes a larger phenomenon in a country or in the world, but initially it’s a question of personal success. So that success has a personal stamp on it. If you want to peel that stamp off and hand it over to somebody, there’re many problems. You mentioned a name, which I don’t want to go back (Laughs) to, but handing it over to the next level of professionals created too many problems – you had to come back again. And if you did not come back, probably things will just, in your f… in front of your eyes, th… the whole thing will collapse like a pack of cards because your whole business depends - it’s not like manufacturing – your whole business depends on the orders of whatever, you know? Even if it’s manufacturing, it’s c… it’s dependent on orders. So this whole thing is a certain level of drive, a certain projection of what you are. So if the next line of leadership is not able to project that… bring that confidence into people, not in the people who work with you - that also is important - but in the outside world then the whole thing will collapse. And there are many things, in the process of building, that you have realized which can never be taught to another person, which they have to imbibe by being around. There’re many small nuances. You know, you… Let’s say in the running of this ashram, there’re many small nuances which I can’t write down and say, “This is it. This is it.” If you write down, it’ll become crude enforcement of laws, which will take away the whole quality of what it is. Just to bring that nuance, every day it’s a tightrope walk. One step this side, it’s wrong - one step that side, it’s wrong. Sometimes you step right on the line and everybody says, “Wow!” One step this side, people… some people are un… unhappy; one step that side some people y… somebody else is unhappy. It’s an endless process of balancing and acting. There’s no perfect way, okay? There’s no perfect way. It is just that it’s working, it is successful. That’s perfect. The only thing perfect about it is it’s working, and it’s successful. It’s successful in the world, that is what is perfect about any business. There’s no perfect way of doing, but now the second line of people who come as repeatedly you’re going back to this… All… All the self-help books, management books are coming up with three principles which are perfect way of doing things. Anybody who’s built anything successful, he knows there is no perfect way – it’s a constant juggle. So, particularly businesses which are crafted around a person, it’s very difficult to pass it on. It takes a certain amount of effort. It takes years and years of culturing people around you to be able to pass it on to somebody. And the effort that it takes to pass it on to people is so much sometimes, you rather do the work yourself because it takes so much effort to pass on a simple nuance of doing something in a particular way that it feels like it’s better you do it (Laughs). And also beyond a certain age, you don’t care so much about the business as you cared about it in the beginning. 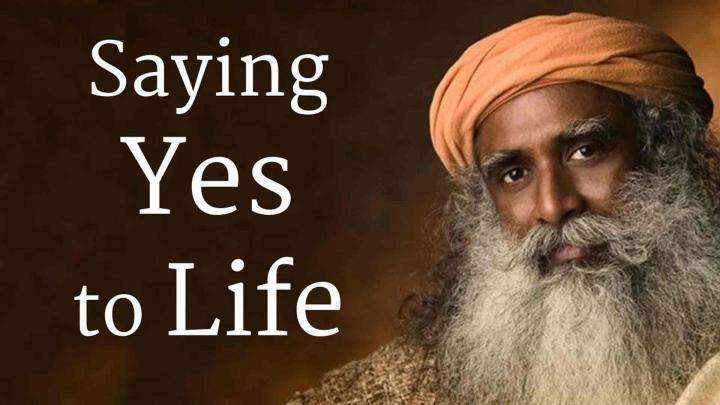 Sadhguru: Succession plan and all these things others may be thinking because they’re only looking at the bubble of success, but that person has done the bubble, blown the bubble and now he’s matured into looking at his life. He’s looking at himself, how he eats in the morning because an entrepreneur doesn’t eat on time, doesn’t sleep on time, doesn’t do anything well when he’s building something. Now he wants to eat well in the morning, he wants to take a walk, maybe he wants to golf, he wants to do something because he knows whether consciously or unconsciously everybody knows when the bones start creaking that your time is limited. Now you start looking – this bubble looks great from outside, is it worth building? Is it worth investing more of your time in this? But at the same time, if you want to pass it on to somebody, you will have to spend more time on it than you doing it yourself. So you’re just hoping, you keep doing it and one day maybe somebody will take over. Whatever happens, you don’t care – something will happen. Some… Somebody will take it and run it. This may be the attitude of many business people and I’ve… I’ve had very c… close conversations with people like that and this is the reality with them and I don’t blame them. It’s fine. That’s why I said right from the beginning, if your interest is multi-dimensional, your growth would be multi-dimensional, you would not feel this lethargy in this. The succession would naturally come because you allowed people to be around you to imbibe things. Not just teaching them - just allowing them to absorb how things are done. So, that would make succession very simple. You don’t have to name – “Okay, this is the guy.” Whoever absorbs, one day you will see that it’s safer in this person’s hands than anybody else’s hands, so you hand over. And that person, what he does – what he or she does with it – is entirely their own, there is no guarantee, okay? There’s no guarantee not necessarily because that person’s responsibility or irresponsibility, competence or incompetence. A particular business may be relevant to a particular time, may not be relevant to another time. And it’s very difficult to come to terms with that - that what I invested my whole life upon is not relevant to the next generation of people is something very difficult for people to come to terms with. So, entirely changing the very focus of business – the business itself – using the financial capabilities that a business has, to change the very focus. That level of entrepreneurship is not always there (Laughs). Sadhguru: I want you to understand, at some point in life, at some stage in your life, human beings lose interest in money. Only somebody, who is very rudimentary in his mind, maintains that interest to the end. Most human beings lose interest in money when they reach a certain point in their life. Initially… Probably, you know, these sayings are going around (Laughs) – “Time is money.” So slowly as you get older, you understand time is life, money doesn’t matter. This… I must tell you this – you can print this also. This happened to a man in a hospital dying, and he just died - just died, just outside the body. So then – he is very rich, he spent his whole life making a lot of money, millions and millions of dollars of money - so then he tried to make a deal with God, “God, just give me just twenty-four hours. I want to just enjoy one day in my life. Every day I was busy making money, I never paid attention to the birds, to the breeze, to the mountains, to the sky, to myself. Even my heart beating I never felt. I was always busy making money. Just give me twenty-four hours. I’ll give you half a million dollars – just twenty-four hours.” God just shook his head, “No.” He said, “Okay, one million” (Laughs). God smiled and said, “No.” Then he thought he’s looking for a better deal, “Okay, ten million dollars – just one day.” He said, “No.” If you go up to a billion dollars it’s still a no, and slowly as age creeps in, you begin to understand that time is not money – time is life. So, as that understanding and experience sinks in, you would want to invest your time in a different way than just about making money. “Okay, if it goes well it goes well, it doesn’t go well it doesn’t go well.” Even I could have failed when I did things. Somebody else is failing – it’s their privilege (Laughs). Namaskaram Sadhguru may be robotics ? My cat Aloo took care of her kitties for a few months. Polar bears nurture their young ones for the icy wild for just 2.5 years. Humans? Just can't let anything go off their hands so easily. As Sadhguru often states its due to entanglement, involvement with just a few selective spheres of life. Unconditional involvement with everything gives the freedom to do all that one wishes to, yet life can't leave an imprint on them. Biggest example: volunteering. So, the journey to blissfulness begins from choicelessness. 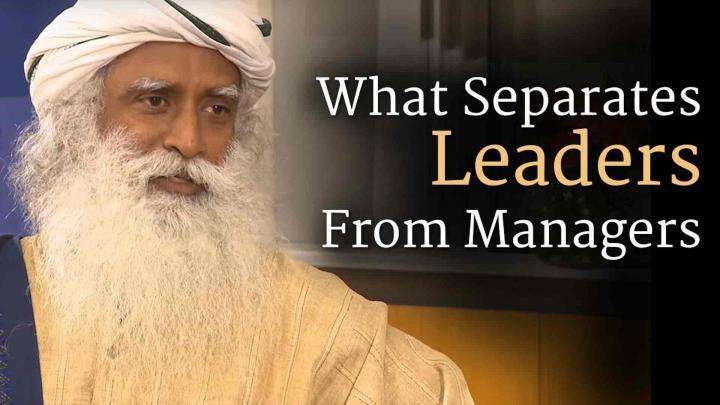 Watch the Video "What Separates Leaders From Managers"
Sadhguru outlines the grim crisis in Indian agriculture. 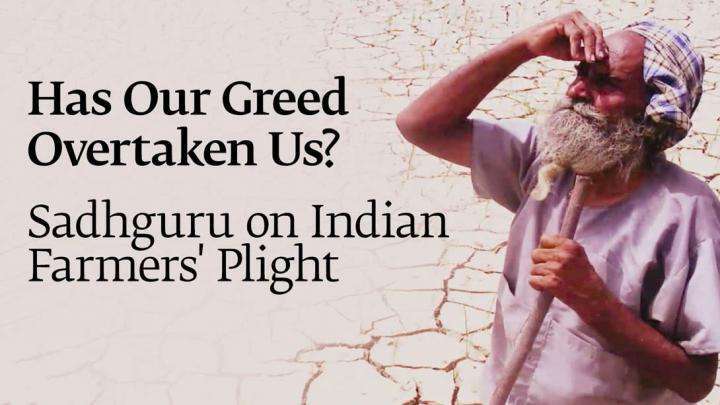 He asks if it is not a shame that the farmer who feeds us commits suicide.